Ed in 3000 at Canadian nationals. Redefining our notions of running limits, M85 Ed Whitlock has crashed more barriers. 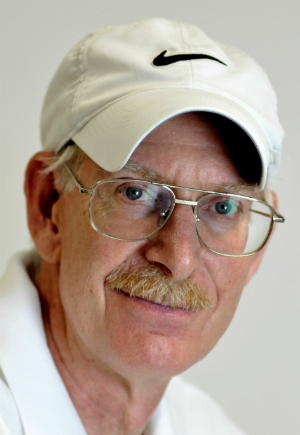 Over the weekend, Ed added two world indoor records to his quiver — in the 1500 and 3000. 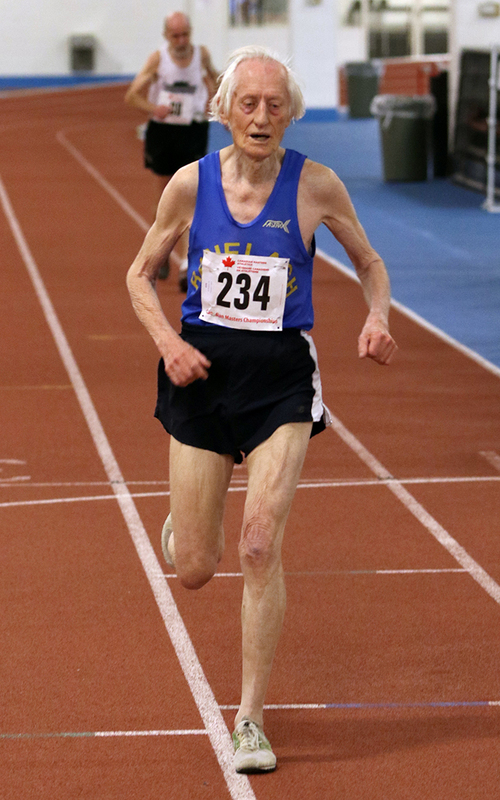 Competing at Canadian masters nationals at the Toronto Track & Field Centre, Ed, who turned 85 a few weeks ago, shattered the 15 WR by going sub-7: 6:38.87, equivalent to an open mark of 3:24.27. The listed indoor WR is 7:18.32 by Sweden’s Holger Joseffson in 2004, and the listed outdoor record is 6:51.32. Ed lowered the listed 3K WR of 15:46.41 by American Hugh Campbell by clocking 13:41.96 — breaking the 15- and 14-minute barriers at once. (The listed outdoor WR is 14:13.4.) Ed’s mark is worth 7:33.32 on the Age-Graded Tables. (The IAAF indoor WR is 7:24.90.) Nationals records fell like flies, too. See complete results. And for fun, Ed dropped down to help an M70 team win the 4×400 relay in 6:02.70. Anybody get the marathon man’s split? For photos, see links on this page. Yup, you can’t tell the M85 frauds without a program. Glad that Ed is legit. Makes his records easier to cover. Who is the oldest to break a 7 minute mile? David Carr maybe. His 6:28 1500 last year at 83 was impressive and probably already eyeing Ed’s 1500 record for next year.